Today, rugby happens to be one of the most popular sports activities across the world. The certificates that you see here have been designed keeping the sport in mind. One look at the templates will give you an idea of the overall theme. All the templates you see here are brilliant in their own way and would be a great way to get hold of exemplary certificates. 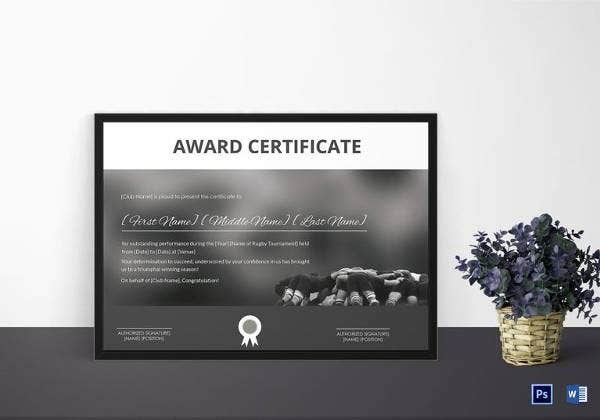 They would certainly save you a whole lot of time and energy and would make your job easier.You can also see Certificate Template. 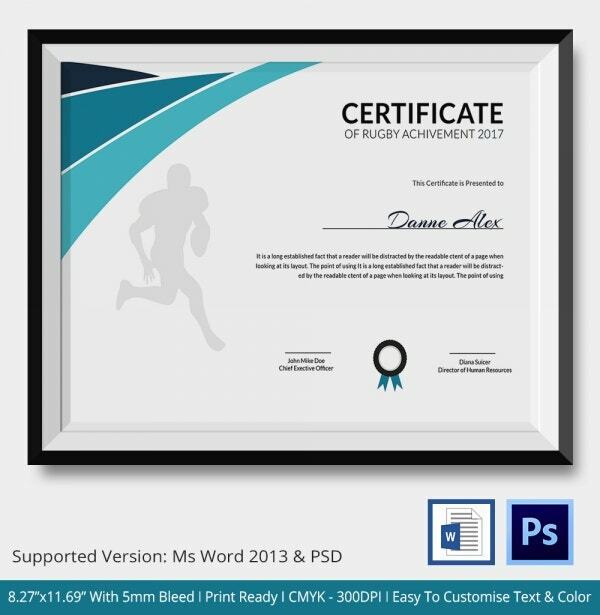 This rugby certificate keeps the entire design and layout simple and compact. The design has been kept professional and elegant as well. It comes in a word format as well. This template has to be one of the most stunning certificates you’ve laid your eyes on. While most certificates you see contain a simple background, this one comes with a darker designer background. 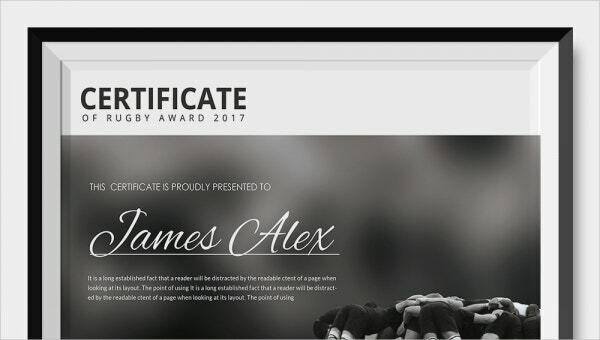 The overall green, white and black theme make the rugby certificate look attractive and well designed. Also the template is fully editable which makes it very easy to use too. 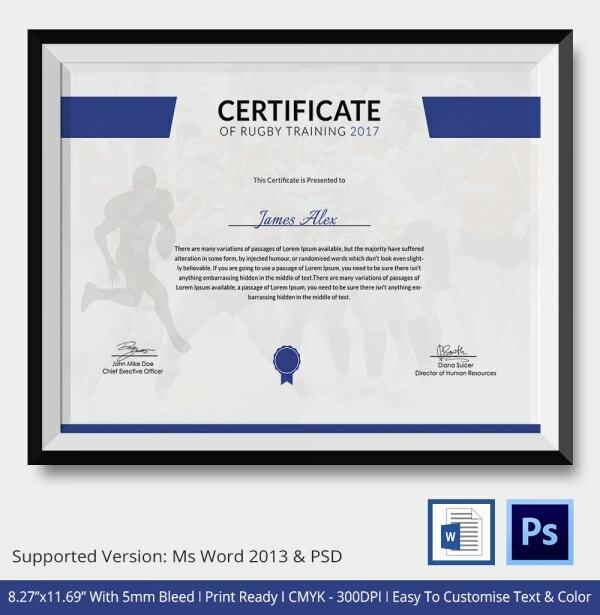 This rugby certificate template comes in a standard size with allowance for bleed, easy customisation of text and images, compatibility with word, psd format, a print ready layout and a high resolution. This certificate would be perfect to award the winners at a rugby championship or tournament. It is attractive in appearance and stunning in layout as well. Plus, it is fully customisable. > How can one use the Rugby Certificates? Although rugby isn’t as popular as other sports like soccer or cricket, it is still considered to be one of the most vigorous forms of sports. The templates that you see here have been designed specifically for rugby players. For instance, if one is taking part in a rugby tournament, then one deserves a certificate to prove that. The same goes for rugby training programs. 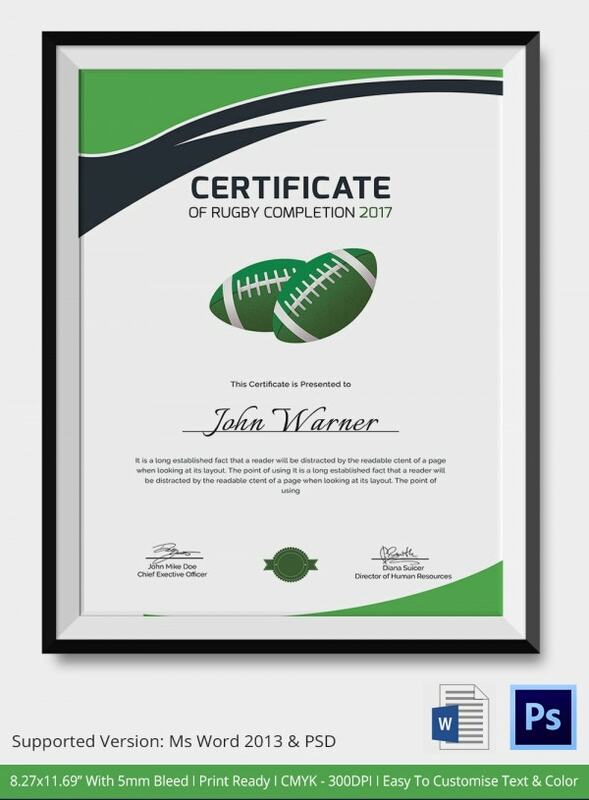 If you have undergone extensive training for rugby, then you need certificates to show that! Thus, the rugby certificates here have been designed in such a way that they appeal to both categories here. > Why should you use the Rugby Certificates? 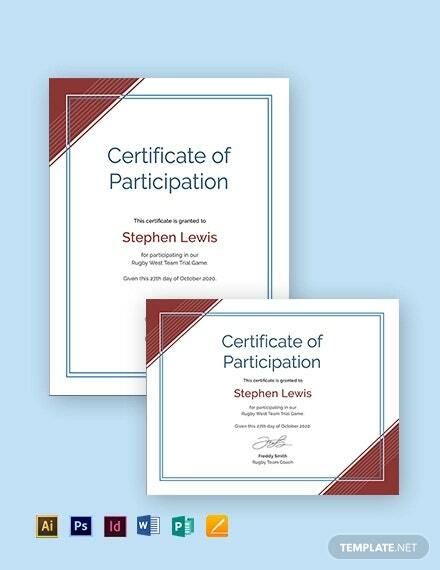 The rugby certificates you see here come in a format that is ready to print. That means, once you download one, you can start printing your certificates if you are satisfied with the overall appearance. The templates are extremely easy to use. If you’re worried that you might find it challenging, then you’re mistaken. As long as you know how to operate word, you should be able to use the templates. The certificate templates already have a format laid out for you. So you wouldn’t have to worry about the layout of your certificate. 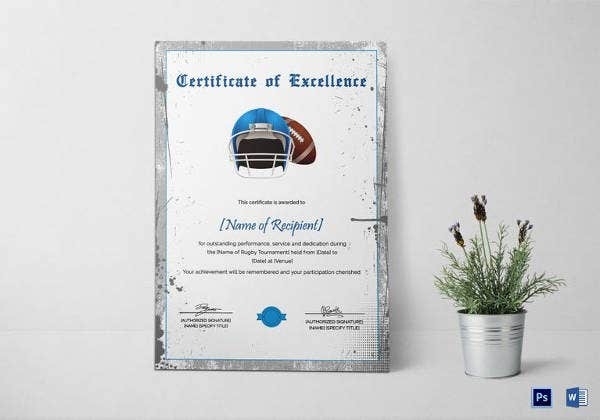 If you are organising a rugby tournament or are planning to start a training program for it, then you need to take a look at these rugby certificate templates. They are well designed, attractive, appealing and professional. That makes them a popular choice! Also, the templates are really easy to use.